Inflammation of the appendix is called appendicitis. The appendix is thin tubular portion of intestine which hangs off the right colon (cecum). It is hollow and connects with the intestine. 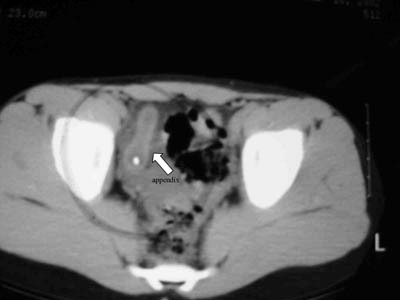 Because of its narrow size, the entrance of the appendix may become blocked. This can occur for unknown reasons, but sometimes occurs when hard stool gets trapped in the appendix and becomes calcified into a stone over time. This stone is call an appendicolith or fecalith. When obstruction occurs, mucus produced from the lining of the appendix accumulates and distends (enlarges the inside of) the appendix. The appendix becomes inflamed and the pressure within the tube gets so high that the blood supply keeping it alive can’t get to the inner layers. 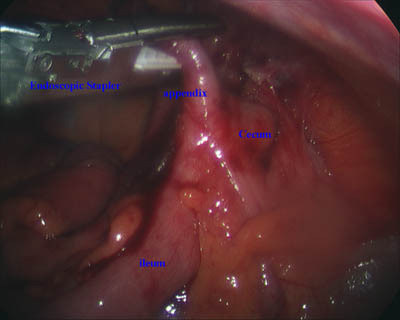 The unhealthy wall of the appendix becomes weak and will eventually rupture. 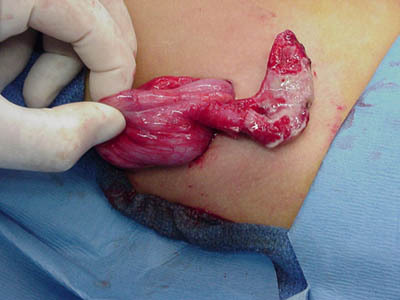 As this is occurring, the abdomen’s defense system (the omentum) attempts to wall off the appendix before it ruptures. If it is unsuccessful, the infection can spread into the abdominal cavity. 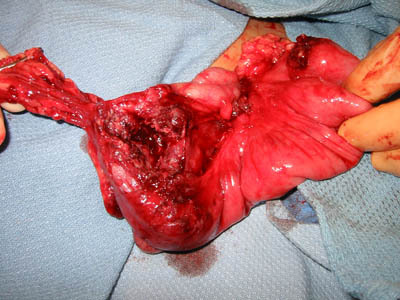 Rupture of the appendix is usually well-contained by the omentum and peritoneal cavity. The resulting inflammation of the abdomen is called peritonitis. Rupture of the appendix is very common (about 30% to 55% in children), but most patients do very well with intravenous antibiotics and fluids. After ruptured appendicitis, the patient is kept in the hospital until the fevers have resolved for 24 hours, and the child is tolerating a regular diet. If they have fevers beyond the 6th or 7th day after surgery, a CT scan is done to evaluate for an abscess. Abscesses larger than 3cm are usually drained by a radiologist, while smaller ones are treated with a longer course of antibiotics. It is possible to develop an abscess even in non-ruptured appendicitis, but the frequency is less. Appendicitis most often presents as pain to the mid-abdomen which then moves to the right lower portion of the abdomen. Nausea, vomiting, fever and loss of appetite are also common symptoms. As the process worsens, pain becomes more intense, and the wall of the appendix may become severely infected and gangrenous (dead). This leads to diffuse inflammation and pain with movement. Diarrhea is uncommon early in appendicitis, but is often seen as a late symptom after the appendix has ruptured. Appendicitis can occur at any age. However, it is extremely rare in the first few years of life. When it presents before the age of 4 years, the appendix is almost always ruptured by the time they are diagnosed. Appendicitis is common in school-aged children, teenagers, and young adults. 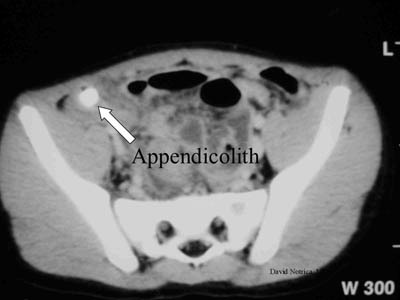 In cases where no appendicolith is seen, there is no clear cause for appendicitis and it is not known why some children get it, and others don’t. There are no definitive risk factors for the development of appendicitis, although some studies suggest constipation and family history of appendicitis may put people at an increased risk. The diagnosis of appendicitis is made by a combination of history (characteristics of the pain, how the pain progressed, etc), physical examination, and special tests when needed. Pain in the right lower abdomen is very common in appendicitis. Ultrasound or CT Scans are often used in order to aid in the diagnosis. Blood tests are also commonly performed to check for evidence of infection (elevated white blood cell count) while urine tests are done to exclude other causes and exclude pregnancy. An operation to remove the appendix (laparoscopic appendectomy) is the treatment for the majority of patients diagnosed with appendicitis. First, your child will be hydrated with fluid by vein (IV hydration), and given antibiotics by vein. Once your child is well-hydrated and felt to be stable, he or she will be taken to the operating room for surgery. The operation itself lasts about an hour, and is done under general anesthesia. The operation is usually done laparoscopically, through three small incisions in the abdomen (measuring about 5mm, 5mm, and 10mm). 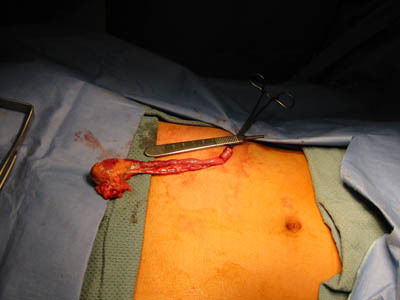 One of the 3 incisions is hidden in the umbilicus (belly button). The other 2 are at the mid and left lower portions of the abdomen, although these are variable depending on patient shape and surgeon preference. A newer procedure is developing in which the appendix is removed with a single incision through the umbilicus. This is called single incision laparoscopic surgery and involves putting all 3 ports through the same skin incision hidden in the umbilicus. Names for this include “SILS,” TUSPLC,” “LESS,” and other names that companies have chosen to trademark. Open appendectomy through a right sided abdominal incision is also an option, but done less frequently now that a minimally invasive procedure is available. Both techniques achieve the same goal, removal of the appendix. The only major difference between the 2 techniques is the size and location of the scars. Infections are not uncommon after appendectomy, and their risk increases with children who present late. The infection in early appendicitis is about 5%. The risk of a wound infection or an abscess (pus collection) inside the abdomen after ruptured appendicitis is higher, around 10%. The good news is that these almost always resolve without more surgery. The interventional radiologist will drain the abscess with a needle and special plastic catheter (drain tube) if the abscess is large. IV antibiotics usually take care of smaller collections or phlegmons (inflamed areas without a well-defined pus pocket). In cases of late diagnosis (symptoms more than 7 days) where the appendix has already ruptured, the operation may be more difficult and may last longer. Anotheroption is to have a radiologist (interventional radiologist) drain any abscess (if present), and then treat the infection with IV antibiotics for 2 weeks. The child would then come back in for surgery 6 to 8 weeks later when the inflammation has resolved. Your child will receive intravenous antibiotics during and shortly after the operation. Depending on the degree of inflammation and infection, antibiotics may have to be continued for several days after. Children are usually discharged when they have no fever for 24 hours and are tolerating regular food. Your surgeon will give you a prescription for pain medication for your child. These may be given up to every four or six hours as needed for pain. These medicines may be irritating to your child’s stomach. It is a good idea to have your child eat something prior to taking them. Vomiting and constipation are common side effects. Rash is a sign of allergy to the medication and should prompt discontinuation of the medication immediately. Once discharged from the hospital, your child will be able to eat a regular diet. It is important to make sure your child drinks plenty of fluids in order to avoid dehydration and constipation. Children require no restriction of activity following appendectomy. They may initial discomfort that limits their activity voluntarily for several days, however. Always wash your hands before touching or cleaning the incision area. Some blood staining of the paper tapes on the incision is common. If pus begins draining from the incision, remove the steri-strip (tape) and let it drain. Let your child soak in a warm tube twice a day for 15 minutes to help all the pus drain. Call the office during the day and they will schedule an appointment to check the incision. Keep the incision dry for at least 48 hours (2 days) after the operation. After 2 days, the patient may shower. Bathing and swimming my resume 5 days after the surgery if the wounds are healing and dry. Abscess: A collection of pus within the body. Cecum: the first part of the large intestine. The appendix is found at the base of the cecum. Laparoscopy: also known as minimally invasive surgery. It is a surgical technique that uses small incisions, a thin digital camera and specially designed instruments within the abdominal cavity in order to perform operations. This is the most common technique used in major medical centers to treat appendicitis. Phlegmon: Inflamed tissue which has not yet formed an abscess. The omentum usually contributes to the phlegmon in the abdomen.